As a photography student at a local community college, I got a chance to use a Minolta MGS 16mm camera. At first my results were pretty bad when compared to my 35mm camera. But I soon discovered, by chance, that the Minolta MGS has a unique ability down here on campus. It fits perfectly in the palm of your hand and it has automatic exposure. So I can take pictures where no man has gone before! Let me tell you a little more about my approach. This description is the sort of thing I have to do in class. The Minolta MGS is the perfect tool for candid photography for several reasons. First, and foremost, it is very small and fits in the palm of your hand. When held by the side of the leg, the thumb rests conveniently on the shutter release and the film advance is easily performed without moving the camera position. As a result, no one knows you have a camera and that you are taking their picture. The MGS is about the size and shape of a cell phone which is a very common item for students to have in their hands. Sure, there are cell phones with cameras, but they don't have the flexibility and quality of the MGS -- as you will see. I wonder if that's a cellphone she's carrying, or if it's a 16mm camera and she's taking a picture of my front while I'm taking a picture of her rear? Another plus for the MGS is the negative size. It is much larger than most 16mm cameras. This provides less graininess in the pictures and even an ability for cropping. You can even use faster, grainer film and still get good results. Third, the MGS has automatic exposure. For candid photography, this is very important. With the MGS, there is no need to spend time making exposure settings. Although the MGS has a fixed-focus lens, this is not a problem. At small f-stops settings, such as f11, the depth of field is 5 feet to infinity. And the MGS has a built-in close-up lens (easily slipped into place with the thumb) that has a depth of field from 3 feet to 7 feet at f11. So with a fast film or a sunny day, it's easy to take pictures of any subject from 3 feet to infinity. This first shot is a full-framed image. I loaded the camera with Ilford HP5 at ISO 400 and set the shutter speed at 1/250. This gives me about f16 on a sunny day with an ability to stop motion. I don't know what the exact f-stop was since the f-stop is set automatically by the MGS camera. OK, my aim wasn't perfect, but I'm working on that. This girl was maybe 10 to 12 feet away and the focus is fine. There is very little grain even in an 8x10 inch picture. It took me a while to figure out, but the blurring in the picture, is a result of several factors. As I move toward a subject, and the subject moves toward me, and as my arm swings (much like hers), the chance of blurring increases. It's important to reduce movement as much as possible. All I can control is my forward motion and the motion of my arm, but that's a big deal. I hope to get crisper pictures by controlling my motion. I also have to improve my aim. Overall a nice shot, for a first attempt. On the next roll, I wanted to check out the camera's the ability to make enlargements. This next shot was also made at 1/250. Also in auto-exposure mode. Fortunately, the subject was not moving. However I was. 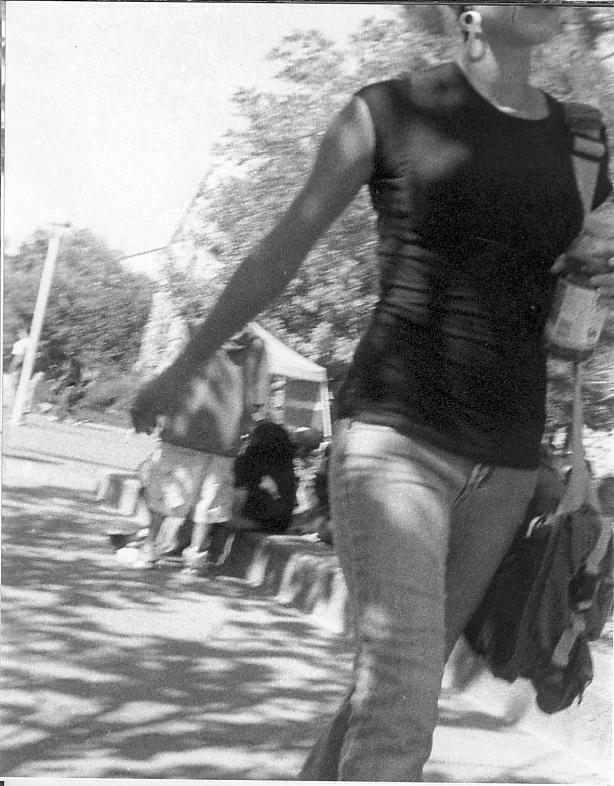 This lass was about 25 feet away, so I needed to crop quite a bit in the darkroom. That's quite a challenge with a small negative. Still, the enlargement worked out fine. This is about one quarter of the 12x17mm negative. That's about a 6x9mm negative. Pretty impressive, I think! The grain is very obvious in an 8x10 print, but not horrible, even though it really doesn't show up on the computer screen. It tells me that the limit to this type of photography is about 25 feet. On my third roll, I wanted to test the ability of the camera to make closeup pictures. The MGS has a built-in closeup lens and it is easy to slip into place with your thumb. This next shot was also made at 1/250. Also in auto-exposure mode. Fortunately, the subject was moving in the same direction as me. I guess that these next two glamour girls were about 5 to 6 feet away. Do they like their legs, or what?!?!? Well, for good reason!!!!! The 8x10 enlargement sworked out fine. The grain is minimal in an 8x10 print. It appears that my aim is improving. The MGS is a great little camera. It gives you quality pictures that you could not normally take. Holding the camera by the leg also gives a unique perspective. I still need to work on my development time. I think that it is a little too low. But not bad.